Written by Catherine Saxelby on Thursday, 25 March 2010. Monounsaturated fats are "good"; saturated fats are "bad"; but what about trans fats? They've been banned in California and listed on fast food menus in New York. How bad are they really? I've sorted through the research to bring you the answers to 7 essential, need-to-know queries. 1. What are trans fats? They are chemically classified as unsaturated fatty acids but the molecules have been "rearranged" or "straightened" so they act like saturated fatty acids in the body. Compare oleic acid, a common cis fatty acid in many foods, with its trans cousin elaidic acid below. Both have the same number of carbon atoms but oleic is bent at the double bond while elaidic (the trans one) sits straight in line - which alters the way it behaves in food manufactaure. Here is elaidic acid, also with 18 carbons in its chain but no 'bend' at the double bond. 2. Why are trans fats used? They have a higher melting point than non-trans or "cis" fats. This means they are more solid at room temperature and under heating which makes for crisper biscuits and crunchier chips, nuggets and corn chips. They are also more stable, less likely to go rancid so have a longer shelf life. 3. Are they synthetic or natural? One type of trans fats is made by bacteria in the forestomachs of cattle, sheep, goats and deer and so occur naturally in the meat, milk and other products derived from these animals. The other worrying type of trans fats is formed through the hydrogenation of liquid vegetable oils. They're the one nutritionists are concerned about. 4. What's the problem with industrial trans fats? They increase your total cholesterol and "bad" LDL cholesterol levels and lower your "good" HDL cholesterol level, causing a deficiency of essential fatty acids. This significantly increases your risk of heart disease, type 2 diabetes and possibly infertility. 5. Is it worse in the US than in Australia? Yes! In the US they've had to hydrogenate soy bean oil to produce hard commercial fats so their intake is much higher than ours. The average American consumes 2 to 3 per cent of his/her daily kilojoules from trans fats compared to 0.6 per cent for an Australian. What's more, most of our trans fats are naturally occurring and have not been shown to be dangerous. Thanks to the Heart Foundation, which has been pushing manufacturers to get rid of industrial trans fats, we've been using palm oil which is high in saturates so already a semi-solid with good shelf life so doesn't need to be hydrogenated. It contains little trans fats but it's still not good for your heart. 6. Where do trans fats lurk? At present most food labels show ONLY the total fat and saturated fat which makes it hard to track them down. 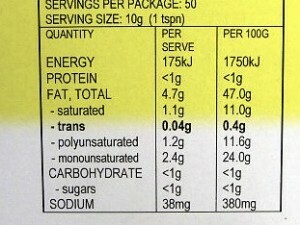 Manufacturers have to list the trans fat only when they make a claim about them such as "Free of trans fat". Most margarines tell you their trans fat content as it's so low - usually less than 0.1 per cent. As a general rule, foods likely to contain higher levels of trans fats are "junk food" - crisps, doughnuts, muffins, fast food, fried food, crisps, pies, doughnuts, microwave popcorn, instant fried noodles, meat pies, sausage rolls, apple pies and croissants- so eat less of those and you'll automatically reduce your intake. 7. Trans OR saturated fats - what's the real worry? In Australia trans fats are not the problem they are in the US. What we do need to worry about is the amount of saturated fats we consume. So remember, don't choose foods based on trans alone try to choose products with the lowest total saturated plus trans fat content possible. Butter vs Margarine. Which is best? How much fat should I eat a day? Q. Is margarine high in trans fat?